Dinosaurs were a big fascination of my childhood and I think most kids can agree. There’s something about them that captures our imagination very quickly at a young age. 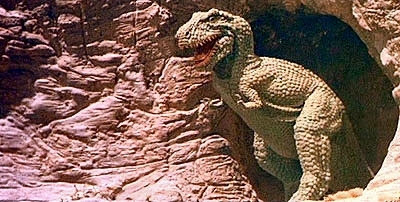 Sure they look really cool, they make for great action figures for kids but I think the big reason they leave such a huge impression on us is because unlike other movie monsters, Dinosaurs actually lived on our planet, they were real life monsters that existed no differently than the animals of today and a part of us can’t help but feel like they should still be here. Why where these mighty giants just killed off so mysteriously, and if they can just parish, why not man, dose their fate preview our own? 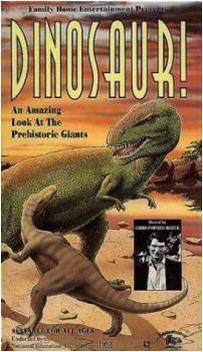 Just the subject of Dinosaurs can open up a world of so much thought, imagination and when I was a kid there was a single documentary film that took my fascination about Dinosaurs to amazing new heights. 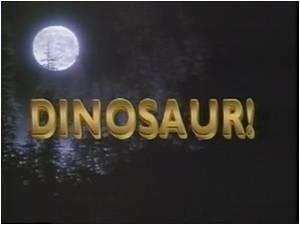 Before “The Land Before Time” in 1988 and “Jurassic Park” in 1993, there was a 1985 TV documentary simply titled “Dinosaur!” and it’s here that my whole childhood fascination on the subject all started. It first aired on CBS in 1985, and re-aired several times in the early 90’s on Disney channel. I still own an old VHS tape, distributed by f.h.e. Family Home Entertainment. This was like the ultimate Dinosaur Documentary, covering Dinosaurs in the media, comic books, movies, attractions, museums, toys, decorations you may see out on the highway or in carnivals. 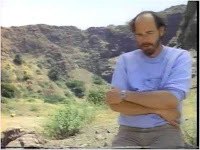 There’s interviews with paleontologists like Jack Horner, scientific discoveries, theory’s on what happened back then, what could happen in our future, how some animals that lived back then still live amongst us today, it just covers an impressive gambit of different Dinosaur related topics in just 60 minutes. The musical score got me so hyped as a kid, and even to this day, it’s still a fun little musical score. Our host for this presentation is none other than the classic Superman himself, Christopher Reeve. He has such a gentle yet mature voice and brings a lot of class and dignity to this documentary. But what really makes his appearance so pleasing is that he’s a really big Dinosaur fan himself. You can feel his genuine love and nostalgia for the creatures he talks about, but he never acts like a kid, he still stays calm and is honestly loving every moment of sharing his knowledge and fascination about dinosaurs with us. To further demonstrate his enthusiasm for this documentary, he flew himself out on his own plan to the American Museum of Natural History in New York, which is his permanent setting thought the feature. He even requested that several of his scenes be re-shot, just to make sure everything was as perfect as possible. This wasn’t just a job for Christopher Reeve, it really meant something to him, and it makes me care so much more about what he has to share with us. 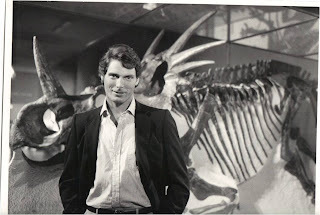 Now I saw this documentary years before I had seen the original “Superman” movie from 1978, and while Christopher Reeve will always be remembered best as the man of steel, I’ll always remember him best as the “Dinosaur” host. 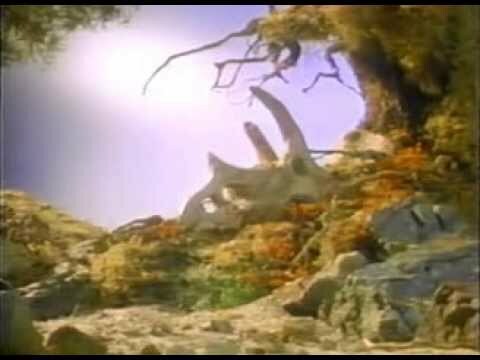 In 1984, an animator named Phil Tippet created a ten minuet short film titled “Prehistoric Beast’s”, and it was a test to improve “Go Motion” animation. Phil had earlier animated creatures in “Star Wars V: The Empire Strikes Back” and later was the animation supervisor for the dinosaur effects in the 1993 hit “Jurassic Park”. The director of this Dinosaur documentary named Robert Guenette was impressed with Phil’s craft and asked him to animate scenes for this documentary alone. In-between takes with our host and other subjects are “Go Motion” animated Dinosaur scenes that show the lives of these creatures in their time. 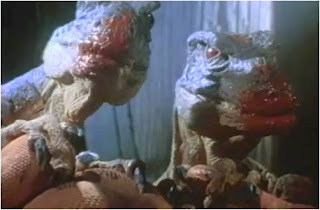 Sometimes there like short films, a lot of which focus on a family of Duckbill Dinosaurs that are raising a single infant. 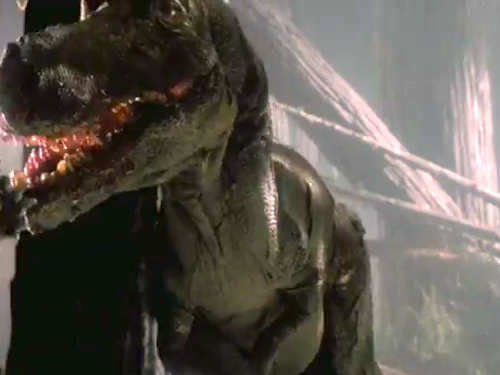 The effects for these Dinosaurs are very impressive for TV documentary standards, in fact they look more genuine and real than the stop-motion Dinosaurs you’d see in actual movies before this. 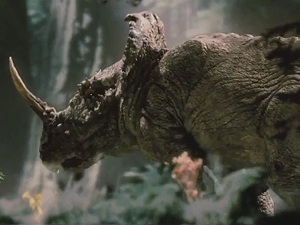 I honestly think these creature effects are cooler than the CG Dinosaur effects we see in documentaries today, and there’s just something really special about this craft. In 1986, this special received an Emmy Award for Outstanding Special Visual Effects. 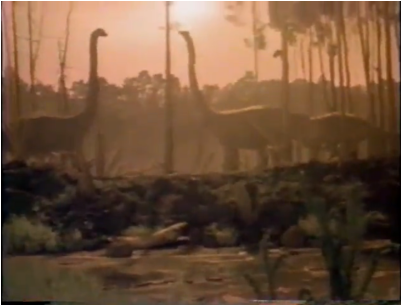 A lot of these Dinosaur scenes could get really scary and violent at times. There’s a scene with a pack of predators ripping the flesh off of another Dinosaur ... it’s so brutal. My favorite part is when the documentary takes a look at the T-Rex, which was my favorite Dinosaur as a kid. This leads to a scene that might just be one of the most terrifying moments of my childhood. 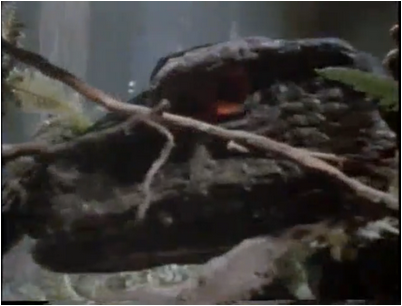 The scene opens with a dinosaur lost in the woods while a T-Rex is lurching in the shadows and walking quietly behind the trees. 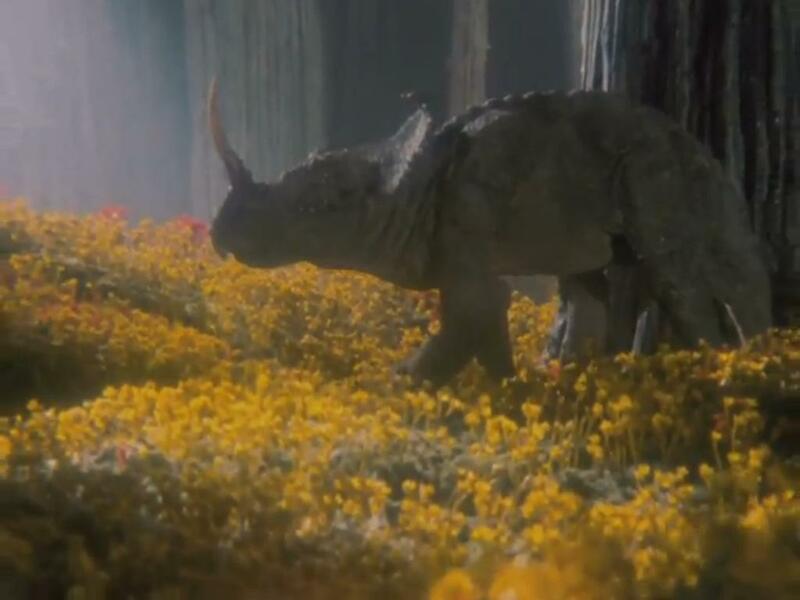 The suspense is just nail bighting, but the T-Rex doesn’t attack right away, instead this pore dinosaur keeps walking around until he finds the remains of other dead dinosaurs. Then when all is quiet, the T-Rex makes his surprise attack! I was four years old when I saw this scene and it scared the piss out of me. The fallowing battle is quiet bloody, with the one dinosaur shoving his horn up the T-Rex’s leg and there’s a piercing musical score that just adds to the intensity of this whole scene. Then just when the T-Rex goes in for the kill, the most bewildering thing happens ... we cut to a kindergarten classroom where little kids are playing with toy models. What the heck, how do we just go from this intense dinosaur battle to the death, then to a room full of kids playing with toys. It’s the most bewildering transition I’ve ever experienced. Perhaps the most freighting aspect of this special is when they go into thoughts on how the Dinosaurs were killed. We get a beautifully created scene of a giant meteor hitting earth, and wiping out the chain of life. It always bothered me to think that something similar could just as easily happen to us. Another moment that always gave me chills is when a scientist determines that if the Dinosaurs had survived, they gradually would have evolved into a species called “Dinosaur Man”. Where then given a wax figure example of what a dinosaur man would most likely look like, and the image of this thing always bugged me. 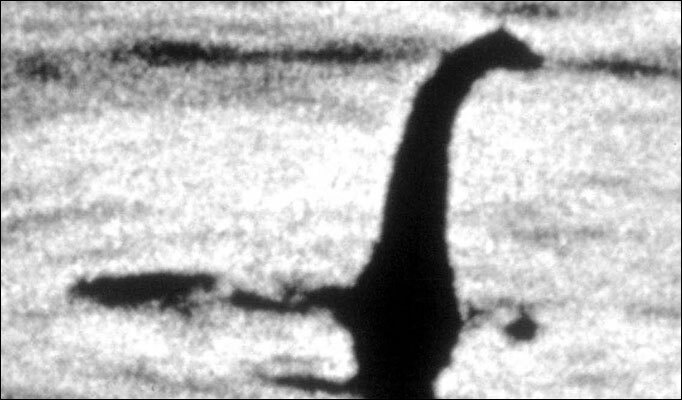 Near the end of this special, we look at modern day myths, and Dinosaurs that may still live amongst us. 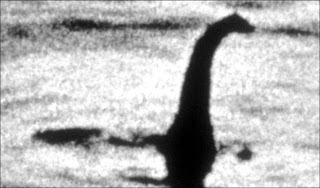 This includes the Loch Ness Monster from Scotland and the supposed Brontosaurus spotted in the African Congo. While these stories are all dated and more obviously myths, they still fascinated me as a child and make for fun stories. 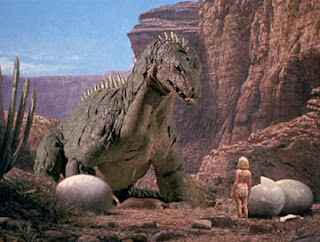 Another really big highlight was when this special looked at Dinosaurs in the movies. I always wanted to identify every movie clip but they were all old films and most of which are unknown to the general public. 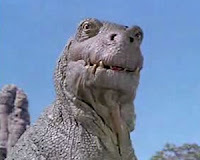 Most of these movies I’d discover on TV or at a rental store and I’d always get excited when I’d recognize familiar Dinosaur movie footage that I didn’t know came from the film. There are moments when they’d play clips from the 1933 film “King Kong” and it was so cool seeing the movie for the first time, and recognizing some of the moments. 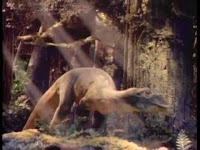 Clips were used from other Dinosaur movies including “One Million Years BC” (1966), “Planet of the Dinosaurs” (1978), “The Lost World” (1925), “When Dinosaurs Ruled the Earth” (1970) “Baby: Secret of the Lost Legend” (1985), and one of my favorite clips was from the 1981 movie “Caveman”, which featured a T-Rex eating an intoxicated plant and falling off a cliff like a drunken idiot. My friends and I would re-wind this clip all the time because it was just so funny. Where also shown a clip of the first animated Dinosaur cartoon ever in 1914 called “Gertie the Dinosaur” and speaking of cartoons, there’s footage of animated classics that reference Dinosaurs including “The Flintstones” cartoon and even the “Charlie Brown” cartoon. Overall, this documentary is about as enchant as the subject material, which feels very appropriate. Like an old dinosaur fossil yet to be discovered, this little documentary makes for quite the find. If you’re someone who still finds Dinosaurs interesting, definitely try and find this film, because it does an amazing job of being informative and educational while still feeling as engaging and exciting as an actual movie. 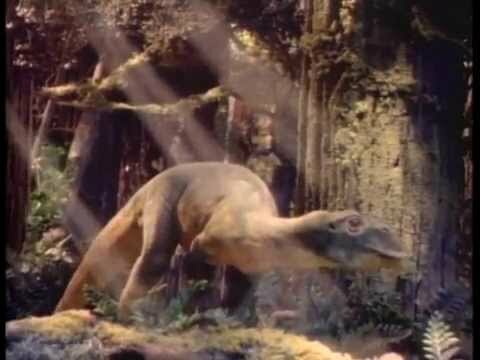 Even though I’m 22 years old, I still hold this little documentary as a small treasure on my movie shelf and it still has the power to take me back to that wonderful time from my child hood, when Dinosaurs were awesome. I give the documentary “Dinosaur!” 4½ stars out of 5.